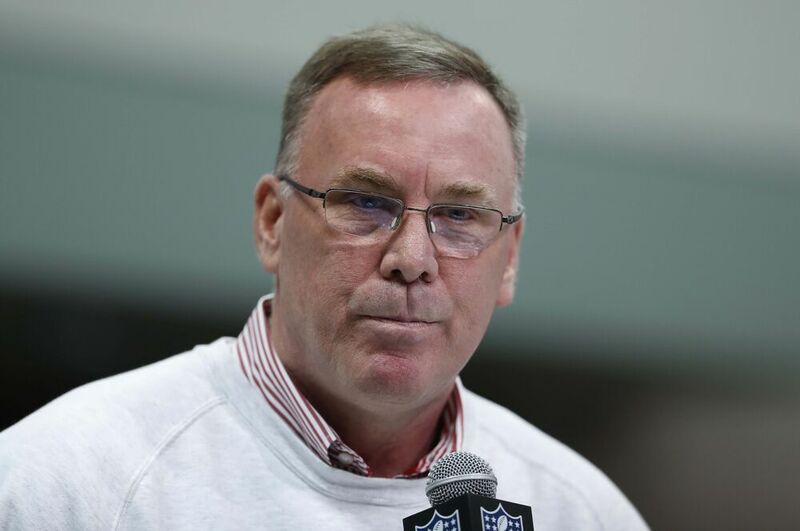 On Thursday, the Kansas City Chiefs shocked the football world by firing general manager John Dorsey. The reasons remain a mystery. Forty-two minutes. That’s all it took for the Chiefs to transition from one of the most stable and successful franchises in the NFL to a topsy-turvy high-wire act. On Jan. 13, 2013, team owner Clark Hunt announced Dorsey as the new general manager, replacing Scott Pioli. Pioli, who had been a disaster of the utmost proportions during his three-year tenure with the club, left behind a miserable 2-14 roster that famously had six Pro Bowlers. Forgotten in that statistic are the other 47 players, who were largely nondescript and in need of replacing. In the time since, Dorsey and Reid combined to make the Chiefs a force, going to the playoffs three times with a 43-21 regular-season record. Since 2013, only the Seattle Seahawks, New England Patriots and Denver Broncos have more wins. In 2015, Kansas City won its first postseason game since the 1993 season, shutting out the Houston Texans 30-0. Last year, the Chiefs won the AFC West. They reached the Divisional round for the second straight campaign, the first time that happened in franchise history. Fast forward five months, and Dorsey is on the unemployed line. There is speculation for the reasoning, ranging from disagreements with Hunt, to a power move by Reid over the release of Jeremy Maclin via voicemail. Then there is the poor salary cap management, which led to the firing of cap analyst Trip McCracken in May. The impetus for the move remain mysterious, but the void created is evident. Kansas City is still a Super Bowl contender, but its long-term picture is fuzzy, something it decidedly was not under Dorsey. In the NFL, the only way to consistently win is to draft well. From 2013-16, the Chiefs selected 32 players. The results have been phenomenal, resulting in three First-Team All-Pros and six Pro Bowl berths. For comparison, the rest of the AFC selected 486 players in that span. It generated a combined four First-Team All-Pros and 25 Pro Bowl berths. Kansas City produced a First-Team All-Pro selection every 10.6 picks, and produced a Pro Bowl appearance every 5.3 selections. The other 15 AFC teams saw those averages balloon to one First-Team All-Pro for every 121.5 choices, and a Pro Bowl selection for every 19.44 picks. The Oakland Raiders were the only team to match the Chiefs. Oakland produced two All-Pro selections and seven Pro Bowl appearances. The Indianapolis Colts, Cleveland Browns, Buffalo Bills and Broncos did not produce one of either despite making 123 selections between them. Dorsey has been especially deft in the later rounds. He repeatedly found starters on the second and third days of the draft, including receiver Chris Conley, guard Laurent Duvernay-Tardif, linebacker Ramik Wilson, special teams ace D.J. Alexander, tight end Travis Kelce, receiver/returner Tyreek Hill, slot corner Steven Nelson and center Mitch Morse. Kansas City also secured its franchise quarterback in April, selecting Patrick Mahomes 10th-overall after moving up 17 spots. It was the first time the Chiefs had taken a first-round quarterback since 1983, with the ill-fated decision to choose Todd Blackledge over Jim Kelly and Dan Marino. If Dorsey did have a flaw, though, it was his cap management. While the Patriots are annually flush with cash, the Chiefs have been against the button. Kansas City waited a year too long on extensions for both linebacker Justin Houston and safety Eric Berry. Both played a season on the franchise tag, and each produced a First-Team All-Pro campaign. The result were a pair of contracts that total $179 million with a whopping $92 million guaranteed. The numbers might very well have been two-thirds their current total if done a year earlier. Even with the release of Maclin, the Chiefs remain $1.8 million over the projected 2018 salary cap. Kansas City will likely release Alex Smith and Tamba Hali to create $24 million in space, but the point stands. Dorsey also has an uneven track record in free agency. On the plus side, the 56-year-old acquired Sean Smith, Mike DeVito, Anthony Fasano, Chase Daniel and Mitch Schwartz on reasonable contracts. Dorsey also signed players off the scrap heap or as undrafted free agents, including Jaye Howard, Daniel Sorensen, Ron Parker, Spencer Ware, Charcandrick West and Cairo Santos. Still, there were significant misses. Maclin was signed on a five-year, $55 million deal with $30 million guaranteed, only to be release two years in. Maclin’s inking also cost the team a third and sixth-round pick with commissioner Roger Goodell finding the team guilty of tampering. Dunta Robinson was signed to a three-year, $13.75 million contract and was jettisoned after one season. Hali, despite a ready replacement in Dee Ford and creaky knees, was signed to a three-year, $21 million pact before last season, with guaranteed money making the contract impossible to get out of before 2018. Hali, fully healthy, played seven snaps in a Divisional round defeat to the Pittsburgh Steelers. The Chiefs now commence on an internal and external search for Dorsey’s replacement. Kansas City would have an easy choice if Chris Ballard were not allowed to leave for the Indianapolis Colts, another layer to this bizarre story. If the Chiefs believed Dorsey wasn’t adequate, why not fire him after the season to ensure the retaining of Ballard? This speaks to Dorsey and Hunt perhaps failing to find common ground on an extension, with Dorsey’s contract set to expire after 2017. Rumors have also been prevalent about Dorsey eventually going back to the Green Bay Packers, where he spent almost three decades as a player, scout and executive. It’s possible Dorsey wanted an out clause that Hunt wouldn’t accept, or more money than Hunt was willing to pay. We’ll likely never know for sure. Smart money is on Brett Veach taking over for Dorsey. Veach currently serves as the Co-Director of Player Personnel alongside Mike Borgonzi, the other in-house candidate. Either is qualified, with Veach interviewing last month for the general manager position with the Buffalo Bills. The Chiefs are left to move on, hoping to replace a general manager who helped usher in their most successful run since the mid ’90s. It doesn’t stand to be easy.